Habitat: sunny, sheltered habitat, but not in full sun. Perennial. Not in full sun. When the flower heads turn purple and the "leaves" begin to open, the artichoke becomes inedible. The artichoke is a variety of a species of thistle and in its first year it normally forms a rosette of leaves and in its second year a flower stalk which can grow up up to a height of 2 m.
Sunny and warm, protected from wind. The soil must be rich in humus and sufficiently moist. The soil must be well drained. Before sowing, soak the seeds for about 2 – 3 hours in lukewarm water. no later than after after the third or fourth year. Each of the cuttings must have at least two shoots with leaves and a good system of roots. The top quarter of the leaves should be trimmed. In autumn, after harvesting, cut the foliage off and cover the plant with compost, straw, turf or leaves and then cover with soil (approx. 20 to 30 cm). Artichokes should be well mulched, watered regularly and fed. Before the fleshy flower buds form, the plant should be fixed to a stick so that the stalk doesn't break. To harvest large flower heads, only leave 4 to 6 buds and 2 to 3 shoots per plant. Replant after about 3 years or replace with new plants. Spraying a film of rapeseed oil will suffocate larvae and aphids. 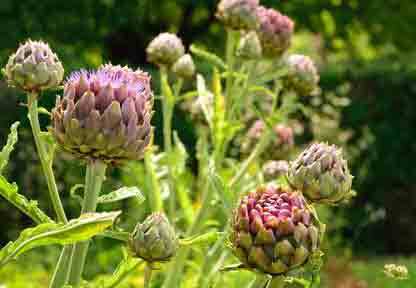 The time to harvest artichokes depends on the exact variety and the location. A significant harvest is generally possible from the 2nd year of cultivation. The flower heads are harvested. When the flower heads turn purple and the "leaves" begin to open, the artichoke becomes inedible. Artichokes can be kept for a few day in a vegetable cooler. It is best to wrap them in a moist cloth. Artichokes i.e. the small artichoke hearts which are particularly tender can be frozen or preserved in oil. The longer the artichoke's stem, the longer it will keep in the fridge. Preserving vegetables in oil is a good way to keep them and makes them especially aromatic. The edible parts of artichokes are base of the leaves and the part that the leaves are attached to, including the stem of tender examples. Artichokes can be boiled, fried or preserved.